A former US Foreign Service Officer, I just spent ten days in Egypt listening to Egyptians from every quarter, including getting caught in the middle of a demonstration in Tahrir Square. These conversations, and what I saw myself, convinced me that what this woman said is true. The 2011 Egyptian Revolution--bringing so much hope to so many--only succeeded in doing away with the Mubarak regime, entrenched for over 30 years. It did not fundamentally change a culture shaped by a history of top-down rule going back to the Pharaohs. What the 2011 Revolution did do was open a Pandora’s box, freeing forces and players who, blinded by the light and unaccustomed and incompetent to deal with the new freedoms, have mostly turned inward, consumed with self preservation and turf wars. What’s missing in Egypt today is any powerful vision of Egypt as a national enterprise, with citizens coming together across party and religious lines. What’s missing is any selfless civic effort to create and support the stability, justice and prosperity that the country so desperately wants and needs. In the cities, you can’t miss the sheer number of smart, capable and well-educated Egyptians, men and women. Egypt clearly has the human resources to attain its goals, but reaching them demands a leadership that has not yet appeared. Many of the brave young people who toppled Mubarak thought that they had created the space in which a whole new society would inevitably grow. Now they understand those hopes were naïve, and their disappointment, frustration and anger builds by the week. With all respect to the young martyrs of Tahrir Square, creating the “new Egypt” will take far more work, patience, and commitment than six weeks of shouting and blood. One of the issues holding back progress is an entrenched, foot-dragging bureaucracy, where Mubarak holdovers still wield important power, especially in the military and police. And at lower levels, getting rid of the rampant corruption of the Mubarak regime has forced bureaucrats and cops to live on meager salaries; many simply don’t show up for work or do poorly when they do. Crime in the streets has skyrocketed, as have the prices of food and gas, and traffic control is almost nonexistent, adding to complaints of citizens who, after more than two years of waiting, had expected something better. But the thorniest issue blocking progress is the inability of Egyptians to agree on the basic relationship of church and state. After a brief period of Army rule, new elections brought to power a government with both its legislative and executive branches controlled by the Muslim Brotherhood, a powerful, secretive Islamist movement whose leaders had been repeatedly jailed by Mubarak and his predecessors. But in exile, the Brotherhood had had plenty of time to organize, and when relatively free elections were held in 2012, it easily trounced a disorganized collection of new secular and liberal parties that had sprung up in the wake of the Revolution. Religion in Egypt is a tricky business. I was struck, in Cairo, a cosmopolitan city, by how overtly religious Egyptians are. Three quarters of the women in Cairo wear the hijab, the Muslim hair-covering scarf. And perhaps another 5% cover all but the eyes. Many restaurants and offices have prayer rugs in the corner and, at the proper times of day, some people will break off conversations to prostrate themselves in prayer. You can buy an alcoholic drink at the top tourist hotels, but almost nowhere else. But these are moderate expressions of Islam, acceptable and non-threatening to the great bulk of Egyptians. What’s worries many, however, is the thought that the Muslim Brotherhood, pushed to the right by more extreme Islamists, called Salafists, is only waiting until it consolidates enough power to turn Egypt into a theocracy, or at least into a neo-theocracy like Saudi Arabia. Rural areas of the country are already more conservative. I don’t think this extreme will happen. For one thing, the Brotherhood is led, not by mullahs in black robes but by savvy, western-oriented business-types who have no wish to scare off foreign investment and tourism by coming across as Taliban. In addition, at least urban Egypt has been a relatively westernized and cosmopolitan society for so long that it seems impossible that Egyptians—especially the many smart, well-educated Egyptian women in positions of real responsibility--would ever stand for an imposition of harsh religious restrictions on daily life. Still, there is real nervousness among many secular and liberal Egyptians as to the Brotherhood’s real intentions, made worse by the Brotherhood’s long history as a semi-secret society, and by the bold cleverness of the Salafists, whose influence has, in the minds of many, already risen to alarming levels. Suspicion and mistrust, primarily over the religious issue, now dominate the political landscape, leading to gridlock There can be no real easing of it until a stable balance is struck between church and state that satisfies enough people so that a government can start to tackle the huge challenges the country faces, especially the failing economy. Foreign investment will stay away, as will the tourists, until Egypt demonstrates that it is on a steady, peaceful course. There is plenty of blame to share for the current mess. The Muslim Brotherhood government, under President Mohamed Morsi , has missed many opportunities to reach out to its secular opponents for the good of the country. It has resolutely refused to try to create a multiparty, multi-religious government focused on solving the country’s problems. Instead, perhaps influenced by its decades as a pariah, it seems consumed by an existential fight for survival, fending off challenges from the secularists on the left, the Salafists on right and a semi-independent court system somewhere in the middle. Now poorly led and managed, bereft of any unifying vision, Egypt and its economy spiral downward. The Brotherhood’s secular opponents seem scarcely better. They’ve squandered the momentum of their magnificent Revolution by fighting with each other. Dozens of secular/liberal parties have sprung up over the last two years, each seemingly incapable of the kind of compromises needed to forge a unified front that could be a competent electoral challenge to the Muslim Brotherhood. The country is on an edge. Still, there are solid grounds for hope. There are simply too many bright, creative, courageous patriots in Egypt to allow the country to implode, or to slide back into feudal Islam. But the fire under the pot is again building. 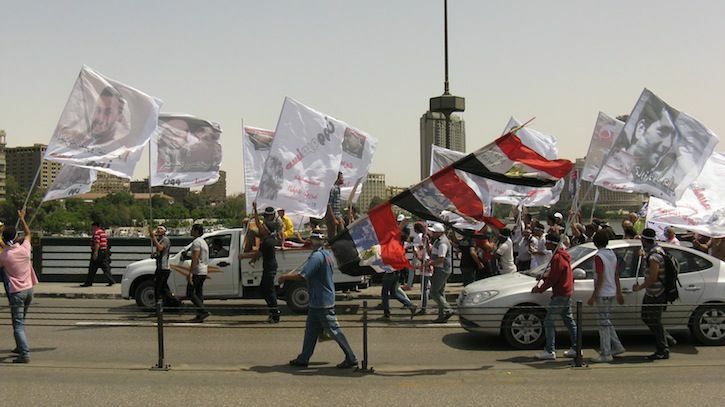 June 30 will be the first anniversary of the Morsi government and many say the violence could renew then. There will indeed be another revolution in Egypt. Whether or not it is violent remains to be seen. Next article: The people will decide.